It is good news that the resurfacing work on Church Road has been completed which is a great improvement. The Parish Council continue to meet with the Liaision Officer from County Council Highways Dept to review other areas where potholes need to be repaired so we are not taking our ‘foot off the pedal’. 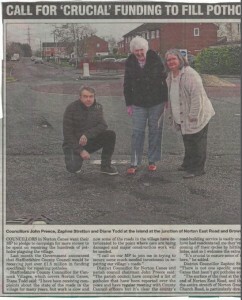 The Parish Council are aware of residents frustrations regarding the state of the potholes on the roads in the village and we have been instrumental in pushing for these roads to be maintained. We have had meetings with both the Highways Dept at the County Council on a regular basis, have contacted Amanda Milling to engage her support for getting the repair of the potholes prioritised. In an attempt to raise the profile of this issue the Parish Council and District Councillors signed a letter which was sent to Mark Deaville, Cabinet Member for Highways and Transport urging them to look at the issues of potholes in the village and ensure that some of the additional Government funding was used to address the potholes. We also raised the issue of the quality of the work that had already been done in some areas of the village. In particular the roads which needed prioritising was Church Road, Norton Green Lane and Brownhills Road with the junction of Norton East Road. We are informed that some work will be carried out this year on these roads and will keep residents informed through the Village Newsletter. Residents are encouraged to report any concerns re potholes to the County Council on 0300 111 8000 or visit http://apps2.staffordshire.gov.uk/web/reportfault.